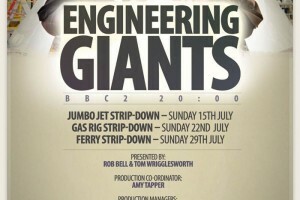 The Refinery has just completed a stint working for Lion TV series producing a new three part science documentary programme called Engineering Giants. It was an extremely tough gig in terms of access and logistics because, unlike Nature’s Giants, these giants of industry (in this case a Boeing 747, an offshore gas platform and a North Sea Ferry), are still worth millions of pounds to multiple stakeholders, even at the end of their lives. The original working title for the programme was Machine Autopsy, but such was the difficulty of finding giant machines that we could follow through from the end of service to final scrapping, that we adopted a hybrid approach instead. In all three episodes our intrepid presenters got into nooks and crannies that, frankly, no normal person would even try to get into. From changing the toilet bowls on the 747 and finding out how a vacuum flush really works, to climbing inside the ballast tanks of the ferry, no space was too cramped for the intrepid Rob Bell and Tom Wrigglesworth. The programmes have now transmitted on BBC 2 and have received outstanding feedback with an audience appreciation index of 87/100, which is very high (and means the audience felt it was worth the licence fee!). In the meantime we will bask in the glow of satsfaction of work that was bloody hard, but which paid off in the end. Giants is currently available on BBC iplayer. To get the insider detail on a Boeing 747, we were lucky enough to get access to British Airways Heavy Maintenance depot at Cardiff Airport (actually, its near Barry, home to “Stacy” of Gavin and Stacy fame, not to mention Uncle Bryn). BA let our cameras in as they tore a 747, Victor Xray apart as part of a major overhaul, but we also went to Cotswolds Aerodrome to see a different 747 being munched up by excavators before the aluminium fuselage went for recycling. The rig in question was not actually a drilling rig, but a gas production platform – the Lima platform. Lima was part of a constellation of gas producing platforms located in the Indefatigable gas field 50 miles off the coast of Lowestoft. (Indefatigable is actually the name of the shifting sandbanks on the seabed, 2km under which gas was found). The Pride of Bruges has been taking passengers across the North Sea from Hull to Zeebrugge for decades, but it was time for a major overhaul to be carried out at the A&P yard in Hebburn ont he South banks of the mighty River Tyne. The first challenge was getting her into dry dock in the darkness at the dead of night. With just a few inches of clearance on either side, it was a feat of piloting skills and navigation, and our presenters got to pull the plug, signalling the exodus of water from the dock. Just a few hours later The Pride was sitting on oak blocks in a massive dry dock, ready for work to be done.